Are You Wondering What that Home in the Neighborhood Sold For? Just fill out the form below, or call us at 214-215-5106, and we will email this information to you for FREE. If you are considering selling your home, you are probably wondering what other homes for sale in the North Dallas and Plano TX real estate market are selling for. There might be one home in particular that you'd like to know the sale price on, or you might be interested in all the homes that have sold recently in your neighborhood. 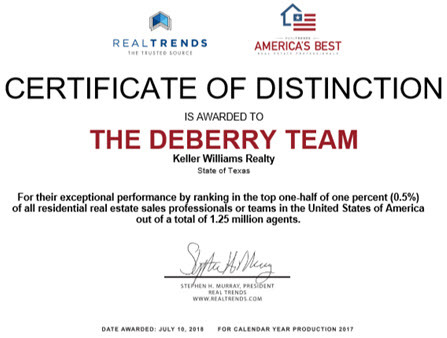 Whatever it is you would like to know, The DeBerry Team can help! I will provide you with a list of homes that have recently sold on your street or in your neighborhood, and I will tell you about homes similar to yours that are currently for sale. This service is entirely free, without obligation on your part, because it is part of the thorough "A through Z" service that we have provided to home sellers such as yourself week in, week out, for over 35 years! Find out, for free, what a home or property sold for! It's our job to help you get an objective perspective of real estate values in the North Dallas and Plano TX real estate market. There's no obligation, and we promise to get back to you quickly. You can get started right now by calling us at 214-215-5106, or filling out the form below.